We love hearing from our customers when they are satisfied! 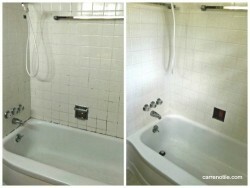 Just a note of thanks for a very neat and wonderful job you did on out tub/tile clean and re-grouting. I want you to know how happy we are with the tile work you did in our new home. Thank you so much! Vernon F.